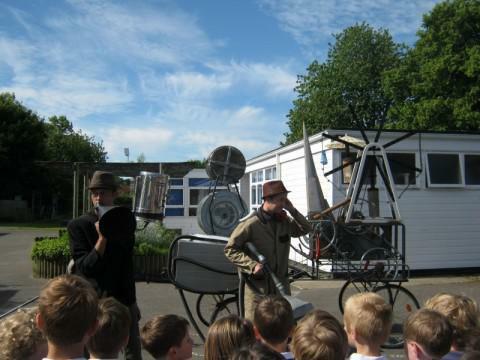 Yesterday, 4th June, two mad scientists invaded the school grounds and caused quite a noise throughout the day. They were on the hunt for a Sound Tree, apparently the fruit of which aids the growth of the Poppycock. Dr Brian Squabbles and Mr Cheeseroaster have the last Poppycock egg in the world and are trying to hatch it by collecting sound. Throughout the day, children hunted for different sounds, these then were hoovered up by Mr Cheeseroaster in his Ohmeter.